The Gardner Bender Network Cable Tester for Coax, Cat3 through Cat6 Ethernet tests for opens, shorts, miswires, reversals and shield continuity. The easy-to-read LEDs of this cable tester pinpoint the exact error of the cable being tested. Tests coaxial cable as well as Category 3 - 6 patch cords and installed, in wall cables for proper wiring. Detects opens, shorts, miswires, reversals and shield continuity. Easy to use - simply connect the 2 halves with the cable needing testing for readout. Includes jumpers needed to allow testing of installed, in-wall cables . Test cables terminated with 4, 6, or 8 pin connectors, plus coax. Electronic Master CAT6211000G 1000-feet UTP CAT6 Network Cable is professional-quality cable with 24 gauge copper clad aluminum conductor, polyolefin insulation and 4 unshield-twisted-pairs(UTP). This can maxima the cable length you can run and guaranteed better signal quality with low impedance cable. The Extended Reach Coax Crimper is designed with an elongated neck specifically for work in confined spaces and for short cable installations. This versatile tool easily crimps compression F, BNC and RCA connectors with an adjustable universal plunger and on-tool markings. The open-channel design makes it easy to insert all connector head styles. Klein Tools also offers Universal Sleeve connectors that are 5x faster to install--they fit all diameter variations within a cable series and even fit difficult to work with multi-shield and plenum cables. Cable Test Plus Coax/UTP/STP Tstr, Tests for Opens, Shorts, Miswires, Revers, & Continuity, 1/Ea The Gardner Bender Network Cable Tester for Coax, Cat3 through Cat6 Ethernet tests for opens, shorts, miswires, reversals and shield continuity. The easy-to-read LEDs of this cable tester pinpoint the exact error of the cable being tested. Tests coaxial cable as well as Category 3 - 6 patch cords and installed, in wall cables for proper wiring. Detects opens, shorts, miswires, reversals and shield continuity. Easy to use - simply connect the 2 halves with the cable needing testing for readout. Includes jumpers needed to allow testing of installed, in-wall cables . Test cables terminated with 4, 6, or 8 pin connectors, plus coax. Cable Test Plus Coax/UTP/STP Tstr, Tests for Opens, Shorts, Miswires, Revers, & Continuity, 1/Ea is rated 2.5 out of 5 by 11. Rated 1 out of 5 by Lee from Malfunctioned. I returned it.... Malfunctioned. I returned it. Rated 1 out of 5 by jimmypodunk from Failed to work right out of the box. Wiggled battery and got a power light for a little while. Right out of the box it failed. I checked battery and it had a full charge. Changed batteries with fresh ones to confirm. Wiggled the battery and got the red power led to light up for a little while. I got it to work somewhat but had to leave the battery back off and apply some pressure to the batteries. It just doesn't seem to make good contact with the batteries. I'll be returning this and getting another brand for sure. I need something reliable to troubleshoot with. And another thing... To save on money and paper they put a little piece of paper in there and tell you to go on line to read instructions assuming everyone has internet still. They claim they're being eco friendly. The online instructions weren't much bigger than the paper that told you to go on line were. Rated 1 out of 5 by cn1561 from junk Fails to read on known good cables. worthless junk. 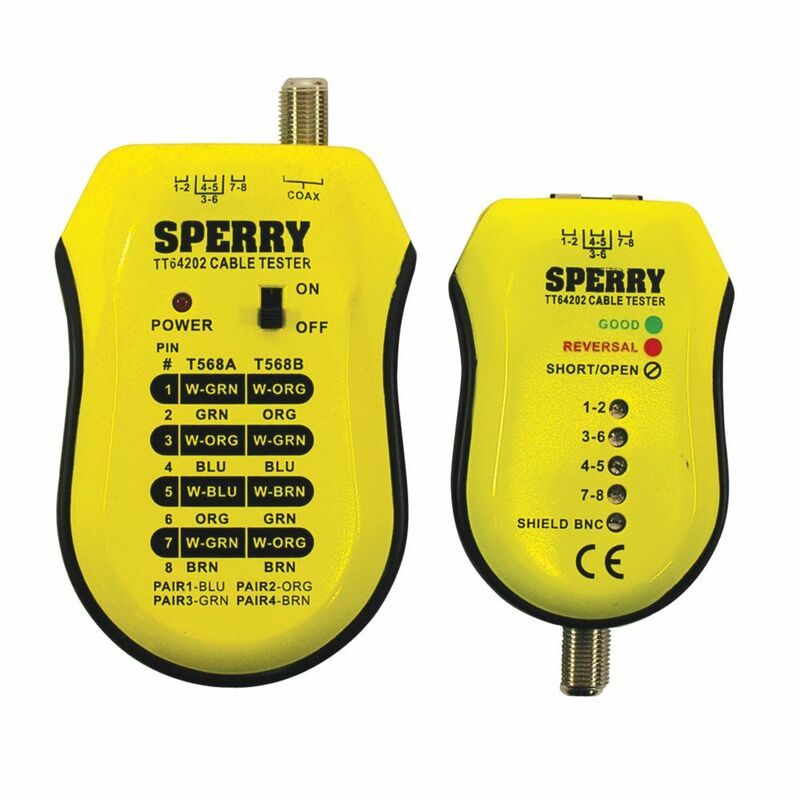 Rated 5 out of 5 by JF30909 from Cable tester - CAT5e and COAX I recently purchased my second set of these (one to leave at my office and one for my tool kit). I have used these testers on HUNDREDS of different CAT5e and Coax cables. I HIGHLY recommend them. They do not eat batteries like my old set. Rated 5 out of 5 by JKFarms from Coaxial and UTP/STP Cable Tester This is my second set of these testers. The first lasted almost 2 years until I dropped my tool bag and broke the main tester (battery powered unit). I have tested thousands of cables (Cat5e) as patch panel jumpers, office lines and uplinks between buildings and switches. The units have always been reliable and do not eat batteries like my previous units did. I have had little need to test RG59/RG6, but they have works the handful if times I needed to test continuity. Price is excellent and I highly recommend them. Rated 1 out of 5 by Greg from Find something else... Easy to use, sturdy shells and works well enough on network patch cables but the primary use for this tool for me.. was for testing RG-6 runs... and it won't do that. No reading on known good cables, no reading from the included calibration pieces. JUNK. Looks like there's a reason there's no mfr warranty provided. Rated 5 out of 5 by Tom from exactly as advertised This tester has been in my tool kit now for years and it has never failed. If other folks don't like it because it ran out of battery power they should try turning the ON/OFF switch to the OFF position. this is a great item. Rated 1 out of 5 by Jason from Tester doesn't even have the correct color code on it !!!!!! I would not buy a tester to test wire map when they don't even know what the correct color code is !!!!!! Has the wrong color code right on the tester!!! WOW !!! !